If you’re one of those people whose wisdom teeth are causing excruciating pain while the wisdom tooth is trying to push through the gum, you might want to explore some home remedies that can reduce the soreness and swelling and help you relieve wisdom tooth pain. Obviously, you cannot stop wisdom teeth from growing, but you can use home remedies to relieve the pain. Home remedies such as clove, peppermint, and sage can help you to reduce the inflammation, treat the swelling in the gums and reduce wisdom tooth pain. Since the toothache often starts during the night, it can be particularly useful to be equipped with some knowledge that can help you deal with the pain when there are no dentists around. Wisdom teeth, or third molars, are the last to come out. They usually start growing between the ages of 16 to 25 or even later. Since by then your mouth is already full, the wisdom teeth can struggle to erupt, especially if your jaw is small and this can result in what is known as an impacted wisdom tooth. Pain, swelling in the gums and cheeks, difficulty chewing and biting, irritation, headache and bad breath are all connected to the so called impacted wisdom teeth. Sometimes, the trouble-making teeth need to be pulled out (although I’ve mentioned in my previous article about the claim that two thirds of all wisdom teeth removals in the U.S. are unnecessary). In other cases, you might be able to use home remedies to get rid of wisdom tooth pain. Garlic can help you relieve wisdom tooth pain and this is due to its antiseptic and anti-inflammatory effect. Garlic can even prevent or slow down bacterial infections in your mouth. To relieve your wisdom tooth pain, crush or mince the garlic clove so it starts emitting its potent chemicals. Then mix it with equal amount of aloe vera or olive oil and hold it against the painful wisdom tooth. Never apply neat garlic as it is very potent and can irritate the gums. You should always dilute the minced garlic before applying it to the affected area. Find here more ways to use garlic as a medicine. Salt is another home remedy that can help you to soothe your wisdom tooth pain by gargling saline water. Salt can also reduce inflammation in your gums. Add a tablespoon of salt to a cup of warm water and swish it around your mouth regularly to relieve the wisdom tooth pain and fight gum inflammation and infection. Tip: Combine garlic and salt. Make a paste by crushing 1 to 2 garlic cloves and add some rock salt. Apply on the aching area around your tooth. Chewing on onion is another tested home remedy that can reduce pain caused by wisdom teeth. Onions have antiseptic, antibacterial and antimicrobial properties that can help to relieve pain and kill germs to prevent an infection in your gums. You can chew a few slices of onion for a few minutes. But if chewing proves to be too painful for you, place a slice of onion on the sore area around your wisdom tooth to fight the pain and inflammation. 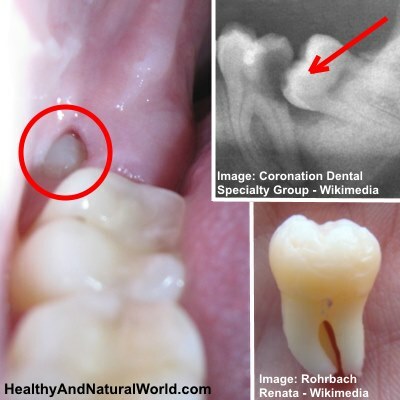 Alternatively, you can extract some onion juice and dab it on the painful tooth and the surrounding gum area to get a relief from the pain. Shallots, red and yellow onions tend to be more effective compared to white and sweet onions. This essential oil, historically used in the Aboriginal medicine, can be rubbed directly on your painful gums to soothe pain and inflammation. Apply one drop of tea tree oil on the painful wisdom tooth and surrounding gum area to get rid of the pain. Massage the affected area for a few minutes to relieve the pain. If you find it too potent, mix the tea tree oil with a half teaspoon of olive oil and use a cotton ball or your finger to access the painful wisdom tooth. Tea tree oil is also one of the best home remedies for gingivitis (gum infection) and it also has 75 extraordinary uses. Guava leaves are an excellent home remedy to relieve toothache. They can help you relieve pain as they contain analgesic, as well as anti-inflammatory and antimicrobial, substances. You can chew on some young leaves to release the juice and fight the pain around your wisdom tooth. or make the following mouthwash: boil a few guava leaves for about 5 minutes. Strain the water and allow it cool. Use it as a mouthwash a couple of times a day to alleviate tooth pain. Clove is a natural pain killer due to its active ingredient eugenol. Eugenol is a natural anesthetic and antibacterial, and it works well at reducing inflammation in the mouth so it can be used for wisdom tooth pain relief. Use the whole spice, its powder or clove essential oil. Whole spice: Hold the cloves close to the painful area around your wisdom tooth (you’ll soon experience the numbness); when the cloves become softer, chew on them to release even more of the healing substances to reduce the toothache. Ground clove powder: Take a pinch and apply to the painful area in your mouth. Clove essential oil: Put a few drops on a cotton ball and hold it against the painful wisdom tooth and surrounding gum area. You can also massage both the gum and the tooth with the clove essential oil. It will provide you relief in impacted wisdom teeth pain. If it feels too strong, you can dilute it with olive oil. Tip: Instead of using clove oil, try oregano oil. This potent essential oil can help you alleviate pain. Oregano oil is also rich in minerals and vitamins and will help strengthen the body’s natural defenses which can help you to fight the pain as well as germs. Clove oil is also one of the best home remedies for dry socket (a painful condition that can happen to some people following a tooth extraction or other oral surgery). Wheatgrass is another natural antibiotic and it draws the bacteria and toxins out, which can help you relieve wisdom tooth ache. You can use wheatgrass juice as a mouthwash or chew on the fresh wheatgrass shoots slowly (spit them out after a while) several times a day until the pain is gone. Peppermint is another old remedy for painful teeth that withstood the test of time and can be taken in different forms depending on your preferences and availability. It soothes wisdom teeth pain and kills bacteria thus preventing the onset of infection. Apply whole leaves: put the fresh leaves in your mouth and leave them for 15 to 20 minutes to soothe the pain. Make a tea: Drink a mixture of hot water, salt and peppermint leaves. Use it as a mouthwash: Put a teaspoon of dried peppermint leaves in some hot water and leave it for 20 minutes. Use the solution as a mouth wash and a gargle to get a relief from the wisdom tooth pain. Peppermint essential oil: Put a few drops on a cotton ball and hold it against the painful wisdom tooth. If it feels too strong, you can dilute it with olive oil. There are more uses for peppermint essential oil and you can read about them in my post about the top 10 uses for peppermint essential oil. Vanilla extract is often mentioned as a natural remedy for wisdom teeth pain relief. It is made from vanilla beans, ethyl alcohol and water. Pure vanilla extract needs to contain 100 grams of vanilla beans per liter. You can apply the vanilla extract directly onto the painful tooth and surrounding gums to relieve the pain. The easiest way is to use a cotton ball and hold it in your mouth for a few minutes. Note: Vanilla extract is not the same as vanilla essence. Vanilla extract is usually a natural product, while vanilla essence is chemically produced vanilla flavoring. Check the label before buying or using as a remedy. Sage is a natural pain reliever and it has a broad spectrum of uses. Sage doesn’t only cure toothache, but it also helps with mouth sores, bleeding gums and gingivitis (inflammation of the gums) due to its anti-inflammatory properties. I’ve already mentioned that you can also make antiseptic tooth powder with sage and sea salt. Mix 2 teaspoon of dried sage and 1 teaspoon of salt in a shot glass. Pour in some alcohol: whiskey or vodka will do. Use the home remedy as a mouth wash and swish it around your mouth for a few minutes. Repeat 2 to 3 times or until the wisdom tooth pain is gone. Use an ice pack on your cheek above the painful wisdom tooth to reduce pain. Avoid hard foods and foods high in sugar. Brush your teeth and tongue regularly and floss between your teeth to prevent gum infection and pain. Practice relaxation and deep breathing for managing the pain. Use oil pulling (oil swishing) to improve oral health, brighten teeth and treat bleeding gums and gingivitis. You might need to experiment a bit before you find the right remedy for relieving the pain. If the pain doesn’t subside and you’re experiencing other symptoms as well, a visit to the dentist is a must. In the U.S., 5 million people undergo preventative wisdom teeth removal each year. However about two thirds of all wisdom teeth removals in the U.S. are unnecessary. Wisdom teeth removals result in a lot of discomfort, pain and swelling. Moreover, they can sometimes cause serious complications. Almost every oral and maxillofacial surgeon advocates the extraction of healthy third molars (wisdom teeth), preferably in adolescence when the roots are not fully formed yet. However, there is a whole different school of thought that objects the extractions of healthy teeth. Jay W. Friedman, a retired general dentist and a consultant, authored an article that was published in the American Journal of Public Health and dispelled some of the myths surrounding wisdom teeth extractions. Most often the removed teeth are classified as impactions. This means that they have not erupted yet and are fully or partially embedded and covered by jawbone or gum tissue. Dentists recommending the removals argue that there is not enough space for the eruption, and that the teeth will cause medical complications if left in situ. BUT it turns out there is little evidence to support this claim. In fact, far more complications result from the actual surgery than from the wisdom teeth themselves. We need to be aware that third-molar surgery is a multibillion-dollar industry, so there are many people who benefit if this questionable practice continues. Dr. Friedman explains that half of the upper third molars recommended for surgery are in fact normally developing teeth and will eventually erupt. They should not be classified as impactions in the first place. Wisdom teeth have their function in the body, or they wouldn’t be there. They are important for the chewing process and add to the biting surfaces. Only about 12% of (truly) impacted wisdom teeth are connected with conditions such as cysts and damage to the adjacent teeth. Infections, treatable with antibiotics, oil pulling and oral rinsing, occur in fewer than 10% of all wisdom teeth. These figures are comparable to pathology associated with appendix. Yet, there are no mass preventative appendix removals. Most people believe that their wisdom teeth will move other teeth and cause overcrowding and overlapping. However, third molars do not posses sufficient force to move other teeth. permanent paresthesia (numbness of the cheek, lips and tongue). broken jaws and fractured teeth. Some of the complications can have long-term consequences and not many patients are informed of these. Dr. Friedman concludes that about two thirds of all wisdom teeth removals in the U.S. are unnecessary. He even views the extractions as a public health hazard due to the complications that result from them. In his opinion, only teeth that have a pathologic condition or a specific problem should be removed. The British NHS (National Health Service) adopted a policy that reflects this view. The practice of unnecessary removal of pathology-free impacted third molars is being discontinued across the UK. Don’t be persuaded into rushed prophylactic removal of wisdom teeth. Seek a second opinion, get informed, and remember that most wisdom teeth can actually be left how they are. Hi Sherry, I’m not sure what home remedies you’ve tried. If the pain is so severe, I would refer back to the dentist and ask for a professional advice. Surely there is something temporary he/she can suggest until you give birth. No one is supposed to be left suffering from such a bad pain without any treatment plan, even pregnant woman. Hi, loved reading your post. Thanks for sharing all these quick and effective home remedies to ease Wisdom Tooth Pain. Though most of them are tried and tested remedies, Wheatgrass Juice and Vanilla Extract is something new that I’d like to give a try. Awesome article! I tried the tea tree oil one, and it helped right away!